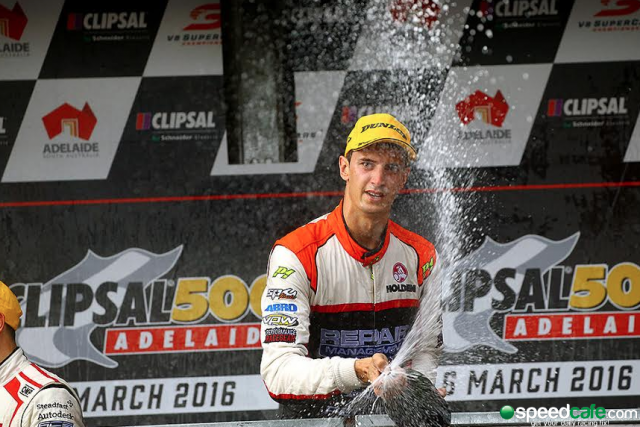 Local driver Nick Percat has given Lucas Dumbrell Motorsport an unlikely maiden V8 Supercars victory in a chaotic final race at the Clipsal 500 Adelaide. Heavy rain wreaked havoc from the outset, requiring a delayed start under Safety Car and eventually a race stoppage after 41 of the scheduled 78 laps. The race was restarted five minutes ahead of its time cut-off with Scott McLaughlin leading Will Davison, Craig Lowndes, Todd Kelly, Lee Holdsworth and Nick Percat. Percat assumed the lead at the start of the final lap as those in front were forced to pit over the final minutes in order to complete their mandatory 140 litre fuel drop. Remarkably, Fabian Coulthard managed to wrestle the lead from Percat at Turn 7, only to lose the position again on the exit. “This is unbelievable, I’ve watched this race since I was in a pram,” beamed Percat. Coulthard and team-mate Scott Pye took the flag second and third respectively but were both dealt 30 second post-race penalties for not completing the fuel drop. The pair were subsequently classified 16th and 17th in the final result. That left Michael Caruso to be elevated to second ahead of Garth Tander, Cameron Waters, David Reynolds, Todd Kelly, Rick Kelly, Jason Bright, Mark Winterbottom and Shane van Gisbergen. Chaos had reigned from the outset, with several teams confused as to whether the initial laps under Safety Car were being counted as part of the race and therefore whether the first part of the fuel drop could be completed. The first stint saw Coulthard and Van Gisbergen trade the lead, with the latter twice dropping back with uncharacteristic mistakes in the wet conditions. James Courtney made his way to the front before being spun by Van Gisbergen, handing the front-running to Lowndes. Courtney, Lowndes and Chaz Mostert held the top three spots after the field changed from wets to dries around the 20 lap mark. Mostert and Courtney then both crashed out in separate incidents at Turn 8, with Courtney’s demise occurring while the heaviest of the rain hit just prior to the red flags. Despite the severity of the rain, little over 10 minutes elapsed between the red flags being called and the field being sent back onto the track for the restart. Uncertainty over which drivers needed to pit to complete their fuel drop made for an intense final few minutes, culminating in Percat sweeping to the front as erstwhile leaders McLaughlin and Lowndes pitted at the end of the penultimate lap. Caruso’s consistent performances across the Adelaide weekend have left him leading the championship standings from Whincup and Tander.